Throughout 8,000 years of shared history, humans have regarded the polar bear with wonder, terror and fascination. It has been spirit guide and fanged enemy, trade good and moral metaphor, symbol of ecological crisis and food source. The bear's meat itself is rich with associations that speak of the fraught relationships between our two species. 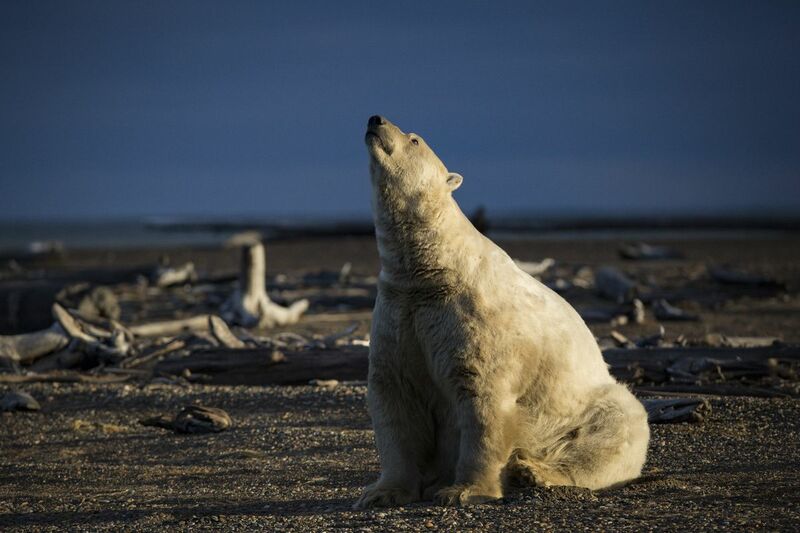 Paraphrasing the French analyst of totemism, Claude Lévi-Strauss, one could claim that the North's Native peoples are taken with polar bears not only because they are spiritually potent — "good to think" — but also because they are physically potent — "good to eat." Throughout Arctic history the bear has served as food, though in most indigenous societies, whales, walrus, seals, caribou or reindeer provided the bulk of the diet. Unfamiliar dishes or ingredients like bear meat strike Western palates as surreal or exotic and, in the case of endangered species, might also be seen as politically incorrect — but from our births onward, the culture that surrounds us shapes our food preferences and what we consider normal or acceptable. Food can be a marker of belonging, contributing to a group's self-image and coherence. Food taken directly from one's surroundings is symbolic of place, forming a link with a people's history. This is why even in countries that banned polar bear hunting, such as the United States, Native groups with a tradition of hunting polar bears are permitted to keep hunting them — and other animals covered by the Marine Mammal Protection Act. 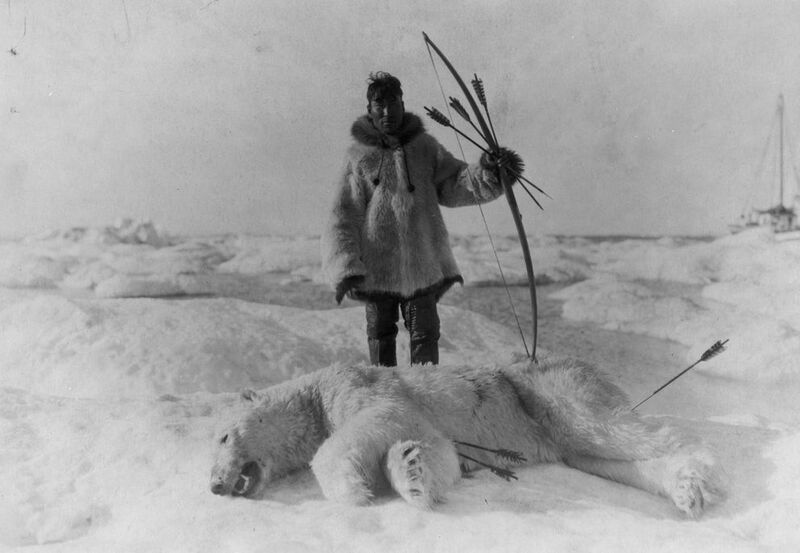 Inupiaq hunter and polar bear, circa 1924. (This photo actually shows the re-enactment of a traditional hunt for a silent movie like Robert J. Flaherty’s “Nanook of the North” but was filmed in Nome, Alaska.) Courtesy of Library of Congress. Together with the bear's humanlike appearance, the richness of bear meat and its rarity in modern diets seem to account for non-Native people's rejection of it. But our culinary preferences have changed. In 19th-century North America, bear meat (though not that of polar bears) was standard fare. Settlers also used bear fat to fry other foods, preferring it to butter. Unlike medieval royalty who kept polar bears in menageries — or later, zoos — which pampered rare collectibles, explorers and whalers, always near starvation, treated the white bears as survival rations. For months, "bear-beef" was often the only course on these men's menu. The meat is much greasier, however, than beef. Norwegian explorer Fridtjof Nansen's captain, Otto Sverdrup, called it a "royal dish" and the explorer himself judged breast of polar bear cub to be delicious. Of course, hunger always has been the best sauce and could have swayed culinary opinions. "Heaven had sent us succor at a time of utter distress," one castaway recalled of a polar bear windfall, "and our gratitude for this miraculous gift was apparent in our overflowing happiness." Having run out of provisions on one of the numerous searches the British launched after Sir John Franklin went missing in the Arctic, Dr. Elisha Kent Kane ate raw, frozen meat from a polar bear head that he had saved as a specimen and called it a godsend. He described the meat of lean bears as "the most palatable food" and "rather sweet and tender," but he warned against well-fed bears, which were made nearly inedible by "the impregnation of fatty oil throughout the cellular tissue." Would-be connoisseurs should keep in mind the possibility of negative side effects. "I did not care to try how it tasted," the English explorer and scientist William Scoresby wrote, "for I was afraid that my hair would turn grey before its time, for the seamen are of opinion that if they eat of it, it makes their hair grey." More serious is hypervitaminosis A, an excess of the vitamin that can be contracted from eating the liver of polar bears, seals and walrus. Affecting the central nervous system, it can cause hair loss, extreme peeling of the skin, birth defects, liver problems, vomiting, blurred vision and even death. One officer swore never again to eat bear liver, no matter how much it might tempt him, after his crew showed symptoms akin to carbon monoxide poisoning. Native peoples have long been aware of this danger, as have explorers, though some felt no worse after eating the liver. Research has shown that a healthy adult person can tolerate 10,000 units of vitamin A. Trouble, if it comes, comes between 25,000 and 33,000 units. One pound of polar bear liver — a fist-sized chunk and barely a meal — can contain 9 million units of vitamin A. 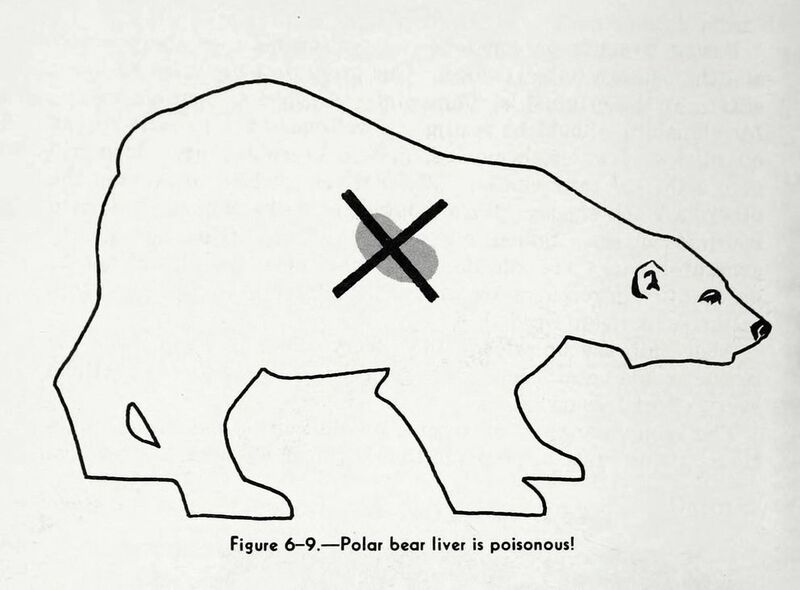 The occasional lack of liver toxicity that some explorers reported can be explained by differences in the age, hibernation and feeding habits of the bear. Native peoples avoided polar bear liver because of its vitamin A concentration, and, like explorers and whalers, fed it only to their dogs. Modern Inuit and Inupiat value the flavor nuances of different bears or parts of a bear. Some prefer den polar bears, instead of bears caught in the open, because they taste better. The Cree consider the front and back paws (tukiq) the best eating. For many Inupiat, polar bear meat remains a favorite meal and a prestigious gift. Nowadays, when a polar bear has been killed, a call goes out on a village radio channel, asking people to get some. The hunter normally keeps the skin, a trophy and commodity. The rest of a bear still is widely shared, a token of group identity and solidarity, a kind of Arctic communion. Unlike the whalers and explorers, who saw it as staple or last resort, indigenous peoples have always considered eating polar bear a reaffirmation of community as much as an act of physical nourishment. Like the widespread idea that animal parts such as the blood, heart or testicles give power to those who ingest them, the human craving for novelty and the desire to understand the unknown by tasting it have shaped human culinary exploration from the beginning. It is not surprising that, in a world of potentially lethal pufferfish entrées and coffee ennobled in civet intestines, polar bear meat has found a place in fine dining. The Norwegian restaurateur André Grytbakk, manager of the upscale Huset in Longyearbyen, Svalbard, occasionally dishes out polar bear steaks with potatoes or a slice of roast in red wine sauce. He also offers a bear meat snack with lingonberry pickle. As it's "a rough kind of meat," the chef recommends a heavy wine with it, such as full-bodied Bordeaux, from the Huset's 1,200-bottle cave. The Radisson in Longyearbyen, which bills itself as the northernmost hotel in the world, even issues certificates to diners who have "eaten a (sic) polar bear entirely at their own risk." These certificates also serve as liability releases for the hotel. According to one guest, the bear meat there is boiled for six hours and fried another two, to kill parasites. Arctic gourmet cooking remains an exception, but holidays matter up north. On Alaska's Little Diomede Island, a stormy Bering Strait outcrop near the international date line, turkeys are hard to find. Undaunted by this, the islanders celebrate Thanksgiving by serving common local fare in the village school. Like many in Alaska, these Inupiat still largely depend on the sea's bounty — blue crab and bowhead whale, seal, walrus and polar bear, which they can legally hunt. Butchered properly, a polar bear yields up to 500 pounds of meat, enough food for dozens of guests. It is hard to anticipate how food preferences will change. In some future day, as a Montreal Gazette column from the 1950s surmised, southern Canadian cooks might be appraising polar bear cuts for steaks or bearburgers. In that case, or if you ever find yourself at Grytbakk's Huset, don't hesitate. Bon appetit! Nigiñaqsiruq! Dig in! Michael Engelhard is the author of the essay collection, "American Wild: Explorations from the Grand Canyon to the Arctic Ocean," and of "Ice Bear: The Cultural History of an Arctic Icon," from which this article has been excerpted. He lives in Fairbanks, Alaska, and works as a wilderness guide in the Arctic.